The 205km Grand Paris Express will connect the suburbs around Paris city. Image courtesy of Hektor. The existing Line 14 of Paris Metro will be extended northwards and southwards as part of the Grand Paris Express project. Image courtesy of Pline. Le Bourget station on Line 16 is designed by Elizabeth de Portzamparc. Image courtesy of Elizabeth de Portzamparc. The Grand Paris Express network will feature 72 stations. Image courtesy of Elizabeth de Portzamparc. The Grand Paris Express network is projected to witness a daily ridership of two million passengers by 2026. Image courtesy of Elizabeth de Portzamparc. The Grand Paris Express is part of the Grand Paris project announced in 2007, under Nicolas Sarkozy’s presidency, to develop Greater Paris into a sustainable metropolitan area. The 205km rapid transit network is located in Ile-de-France, France. The project involves construction of four new automatic metro lines around Paris and expansion of two existing lines of Paris Metro, with the aim of providing direct connectivity between suburban districts without having to travel through the city centre, while also linking important transport hubs in the city. Société du Grand Paris (SGP) is the overall project owner and contracting authority and the state-owned public transport operator Régie Autonome des Transports Parisiens (RATP) is the operator of the network. The estimated budget for the project is €22.6bn ($28.29bn). "The network is projected to have a daily ridership of two million passengers by 2026." Construction of the new lines began in June 2015 and is being carried out in phases up to 2030. The project is estimated to remove approximately 150,000 cars from Paris roads. The network is projected to have a daily ridership of two million passengers by 2026. Up to 20,000 direct jobs are expected to be created each year during the project’s implementation phase. Société du Grand Paris (SGP) was created in June 2010 after the adoption of the Grand Paris bill by the French Parliament in May 2010. Public debates and an agreement between the French State and the Ile-de-France Region led to the merger of two competing projects, Arc Express and Métro du Grand Paris, giving rise to the Grand Paris Express in January 2011. The project is being financed 30% by the French Government via SGP and 70% by the local authorities through earmarked taxes, subsidies and loans. SGP will receive €1bn as budgetary support from the state. The existing Lines 11 and 14 of Paris Metro are being extended and the four new lines to be constructed as part of the project are named as Line 15, 16, 17 and 18. 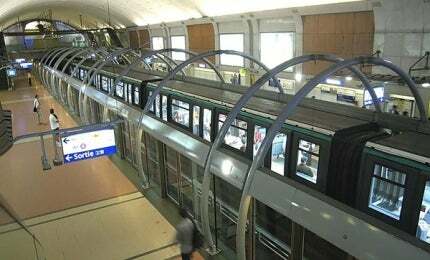 The Line 15 will run 75km underground following a circular route to connect the towns of La Défense, Saint-Denis, Rosny-sous-Bois, Champigny-sur-Marne, Villejuif, Issy-les-Moulineaux and Nanterre. The 25km-long Line 16 will connect Noisy-Champs to Saint-Denis Pleyel. The 27km-long Line 17 will link Le Bourget and Roissy-Charles de Gaulle Airports and run from Saint-Denis Pleyel to Le Mesnil Amelot. The 35km Line 18 will travel from Orly airport to Versailles Chantiers and have stops in Massy and at CEA in Saint-Aubin. Line 14, the backbone of the new network, will be extended northwards up to Saint-Denis Pleyel and southwards up to Orly Airport. Line 11 will be extended eastwards up to Noisy-Champs. The Grand Paris Expressway network will consist of 72 stations, out of which 57 will be newly developed by SGP. Platform screen doors and glass facades will be installed in the stations to separate platforms from the track, which will ensure high safety standards . Both surface and underground stations will contain a lobby, shops, as well as areas dedicated to ticket sales, passenger information and hospitality. Fully automated, driverless trains will run on the new network at an average speed of 60km/h, nearly double that of the current Paris Metro network. The Line 14 extension will continue to be operated on the existing Alstom MP 89 rubber-tyre trains that also operate on Line 14. The southern section of Line 15 will use steel-wheel trains consisting of three cars with a combined length of 54m. Similar trains will be used on the Line 16 too. The Grand Paris Express network will run 75% underground. A two-lane subway tunnel with 10m cross-section will be created using tunnel boring machines. The 100m-long tunnel boring machines will drill at a depth of up to 55ft below the surface at the rate of 10m to 12m a day (3km a year). Five TBMs will work simultaneously on the Lines 14 north, 16 and 17, while seven machines will operate on the Line 15 south. Wells up to a depth of 40m will be dug into the ground and located every 800m or less to provide ventilation to the tunnel and access to the wounded during rescue operations. Southern Cross Station, formerly known as Spencer Street Station, began operations way back in 1859. The underground stations will be built on approximately 9,000m² sites. A reinforced concrete waterproof diaphragm wall will be built around the future underground station to create a 60m-deep box before excavation. Approximately 60% of civil engineering work and the entire excavation work at the underground station sites will be completed before the arrival of the TBMs. Horizontal reinforcement will be provided to the walls of the station and the internal structures consisting of the multiple levels, mezzanine, platforms and a roof slab will be built following the excavation. In September 2013, The Artemis consortium formed by engineering firms Artelia, Arcadis and BG Ingénieurs Conseils signed a 16-year €40m ($50m) contract with SGP to be the overall project manager and oversee the infrastructure operations for Lines 15, 16 and 17. Systra was awarded a project management contract in the same month to work in collaboration with RATP to provide technical assistance on the rolling stock and automatic train control systems for Lines 15, 16 and 17. A Systra-led joint venture comprising architects ANMA Agence Nicolas Michelin Associés, Agence Richez Associés, Valode and Pistre Architectes, and Atelier d’Architecture Kin Kon will be responsible for the infrastructure design and construction supervision on the south-eastern section of the Line 15 between Noisy-Champs and Villejuif Louis Aragon. The infrastructure on the section from Villejuif Louis Aragon to Pont de Sèvres of the Line 15 will be developed by Setec, along with Ingérop and architects, Philippe Gazeau, Ar.Thème Associés, Atelier Barani, Périphériques Architectes, Brunet Saunier Architecture and Agence Duthilleul. An Egis-Setec consortium was awarded a €96m ($120m) engineering, procurement, construction and management (EPCM) contract for electrical and mechanical system equipment on the lines 15, 16, 17 and 18. SGP awarded the design contract for the Le Bourget station to Elizabeth & Christian de Portzamparc (AECDP) in October 2014. Miralles Tagliabue and Bordas + Peiro were selected for the Clichy-Montfermeil station on the Line 16. Contracts for project management studies, civil engineering works and other facilities on the Lines 16 and 17 were awarded to two consortia led by Egis Rail. The SNC-Lavalin consortium secured a project management services contract from Société du Grand Paris (SGP) for Line 18 in September 2015. In October 2015, Arcadis was awarded an extension contract to provide project management services to Grand Paris project for a period of 15 years. Implenia secured a contract for construction of the Lot GC01 section of the Line 11 extension towards the east of Paris. The ICARE consortium secured the infrastructure design and supervision contract for Grand Paris Line 18 in February 2016. In early 2015 all of IMI plc's fluid power businesses were brought under one heading, IMI Precision Engineering. IMI Precision Engineering is the new trading name of Norgren, and the world-class range of products has become IMI Norgren, IMI Buschjost, IMI FAS, IMI Maxseal and IMI Herion. Austria-based Maschinenfabrik Liezen und Gießerei (MFL) is a world-leading supplier of stationary and mobile rail milling and rail processing machines. MFL also delivers complete rail production lines as general contractor.